I went to go see The Rite in theater's a few weeks ago with my family, and truth be told I wasn't sure exactly what type of movie I would be walking into. I was unaware that this supposed "Horror Flick" would make me think deeper about my faith in Jesus Christ. I surely did not think that a story about one of western civilization's more taboo subjects, Exorcism, would make for a great family discussion later on about faith, and the light and the darkness combating one another during our very modern days with my family after we got out of the movie theater. That said, perhaps you are now wondering why I would choose to watch such a movie about exorcisms and demons of all things and then choose to write a review on it after all of the other countless more light hearted movies that I've watched over the years that I could review instead. Honestly, my answer to that question is that there have been quite a few movies labeled as "Christian" films that have come out over the years (or ones with 'supposed' Christian themes), and for the most part they were living up to their label in their reviews in my opinion, however there have also been other movies out there that have been cloaked in and labeled as "Christian Truth," or bits of truth that were indeed not "Christian," and that is why I feel the need to watch these so called labeled "Christian" movies, to decipher them for myself and then to share my thoughts on them with you. Michael has had enough of working for his father as a mortician and decides to try out, and gain some answers about Faith all the while, by looking into his family's other handed-down-through-the-generations second choice occupation: The Catholic Priesthood. Michael enrolls in seminary, and his journey of travelling into the unknown darknesses and light of the world truly begins. A tragic event occurs right before Michael goes through with his vows of Priesthood, and then he starts to questioning everything all over again. Michael sends a message to Father Matthew at the school via e-mail saying that he cannot do it (go through with his vows) and that he desires to withdraw from seminary, and then the friendly Father decides to come and talk to Michael about Faith, the Priesthood, and a possible trial-run across seas that he'd like Michael to experience and see for himself, to possibly strengthen his Faith in God and make him reconsider backing out of the Priesthood. 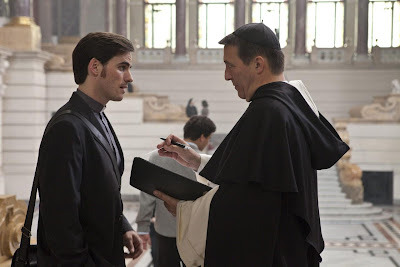 Father Matthew asks Michael to hold off on his taking vows and possibly leaving the seminary completely just yet, and convinces Michael to travel to Italy to study exorcism. This is a big decision for Michael to make, but if he backs out of seminary his schooling costs will be left for him to pay in it's entirety: $100,000....yeah, yikes! Michael decides to take this on and see just where Faith, or his lack thereof leads him. After Michael reaches Italy it's pretty clear that he himself doesn't know why he is even there. While at the exorcism class Michael meets an attractive young woman, named Angeline, who is a reporter with an interesting past who is also studying in the exorcism class, she just so happens to also be placed in his life for a reason (but I won't spoil it for you!) 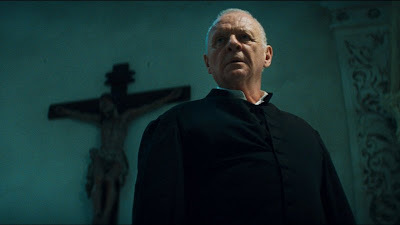 Father Xavier, sees that perhaps he is not getting through to Michael in the way he thought he would be able to, and at his suggestion Michael goes and visits the rather unusual character and exorcist that is Father Lucas (played by Anthony Hopkins.) After meeting Father Lucas Michael experiences his first exorcism in person, that of a young pregnant teenager. 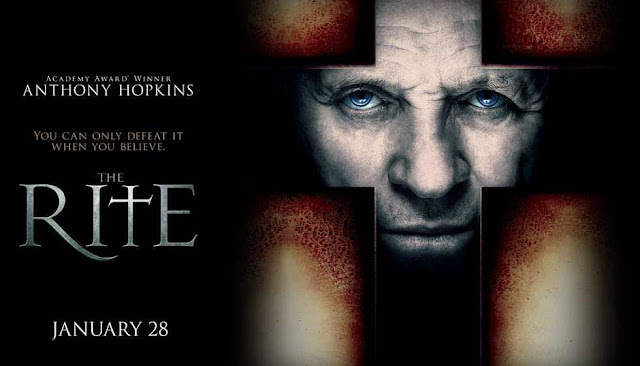 After seeing the exorcism (which has been number I dunno out of how many they've already done) on the young possessed woman Michael still is not convinced in his Faith or in the rite and acts of exorcism. Father Lucas's methods are somewhat out there compared to the usual exorcism practices of the Vatican, and this only makes it harder for Michael to understand and accept the things that are seen and heard before him. I will admit that after watching the exorcism(s) in this movie (I've actually seen one done before on a young woman who was truly possessed.....on a show....totally legit) that they were indeed true to form, and authentically showed how demons work within their host vessels. I cringed as the young woman seemingly disappeared and the demon took possession over her and her body. The young woman writhes in ways unimaginable to the human mind, and it is a bit disturbing at moments what with the demons words flowing from the pretty young woman's lips, but then again Satan disturbs me. I don't know about you! I won't tell you any further than this of what happens in the story, because I do not want to ruin it for you! The morgue scene was a bit too realistic for me (if you know what I mean.) The dead bodies are covered where it counts, but they are dead after all (quite creepy) and being prepped for burial which might make some people's stomach turn as it did mine a teensy bit. When Michael goes to the exorcism classes there are slides that can be glimpsed of possessed individuals with dislocated jaws, etc. This may be disturbing to some. The demon that Father Lucas and Michael are trying to combat is very malicious in it's nasty usage of language and making bodies writhe, which at times can be very disturbing. I will admit that there was one line that the demon says while it is within Rosaria that completely turned my stomach to goo and made me feel sick (but it made you feel what it was intended to, that Satan will try to knock your wind out of you at all costs no matter what through the words he speaks while trying to sway us to the darkness, etc.) Rosaria, while taken over by the demon, writhes suggestively on the floor for a few moments. As far as bad language goes, this Horror flick didn't have too much. Actually, I was quite surprised that the language and words and things that the demon spoke about aloud were not MORE colorful than they were. Michael does use the f-word at one moment, where really it did not need to have been used (nor does it EVER though.) Most of the iffy language is said by the demon possessed individuals and not the main characters. 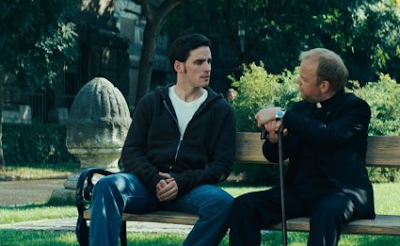 Michael doubts himself, Father Matthew, Father Xavier, Father Lucas, and God and pretty much everyone around him. He wants an answer to everything that he's faced in life so far (the death of his mother, why his father is the way he is, what steps to take next in th world), but doesn't know if he wants to fight for it or not. This doubt of knowing naught where to go or what to do in his life drives his footsteps throughout the first half of the movie, and his doubts are tested and tested yet again. 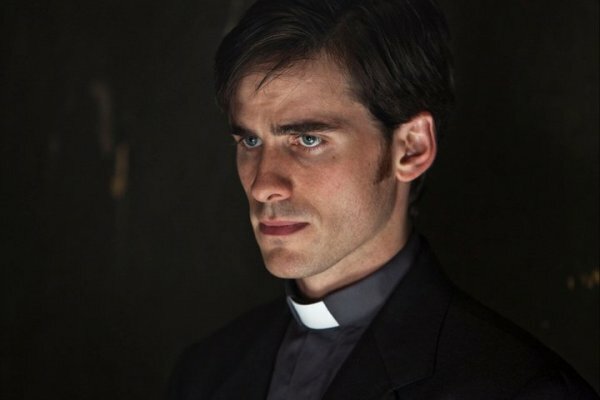 Not only does he learn about demonic forces and exorcisms in the classroom, but when he starts shadowing alongside Father Lucas Trevant things get even more confusing for this almost Catholic Priest. 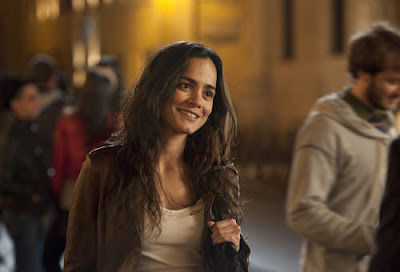 Experiencing an exorcism of a young woman named Rosaria, and performing one himself in the second half of the film starts to shape him into the man of faith that he is destined to be. Michael has many choices to make as time begins to tick away, a young woman begins to fight for her life and her unborn child's life; other threads and trails of the demonic plagues start to surround and follow Michael and Father Lucas as the story continues on, and then finally both men begin to face their biggest fears and tests yet (it will blow your mind I assure you!) I will not spoil the ending for you, but know that there is a dynamic shift in light versus darkness in the last few moments of this movie. Just like Michael Kovak we are all searching for the light and truth. This brilliant movie (in my opinion) is disturbing in all the right ways. Satan and his hoard of demons should sicken us and be known as reality to each and every one of us in it's most disturbing manner. This movie made me cringe, it tested my own faith, it broadened my knowledge of God and Satan and it caused me to be stripped down in my faith like Michael, and then I had to search for the answers all over again. I loved and hated the way this movie made me feel, which in all honesty is a wonderful thing. This films major religious views are that of Roman Catholicism. 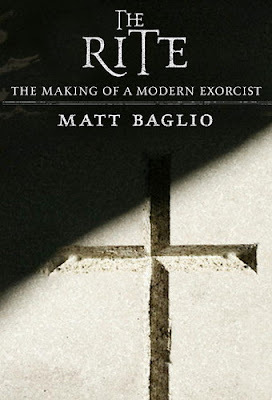 While I have no issues with the rite of exorcism within the Catholic Church and Faith (I sometimes wonder why say a Baptist Preacher does not learn how to perform the rite of exorcism on possessed individuals? Why is exorcism seen and practiced as an only 'Catholic-thing?') I do have issues with some of their doctrine. In my opinion this movie, if watched with a strong stomach and an open mind, has so much to offer on the subject of Faith. There is truth to be glimpsed within this film, and many hard questions to be answered as you travel alongside Michael Kovak on his Faith journey through darkness and into the light once again. I would give this move somewhere between 4 - 4 1/2 stars out of 5. The cinematography, actors, score, lighting, themes and storytelling are all a sure-fire win in my book. Sure there may have been times when I cringed and squirmed when certain words were uttered by demon possessed individuals throughout the movie, but you must take things with a grain of salt and keep in mind that Satan is real and he is no "Angel!" Are there any "Christian" labeled movies that you have heard about that you are not too sure about watching (perhaps you'd like me to watch it and review it here on dotk?) What are they? Have you watched any controversial religious films? What are your thoughts on these types of films? to life i say "Do Your Worst!"